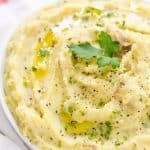 Instant Pot Mashed Potatoes are a time saver and made in about 8 minutes! They come out perfectly creamy, light, and fluffy every single time! Mashed potatoes are one of my weaknesses because how can you resist creamy, flavorful, and perfectly seasoned potatoes that melt in your mouth? I can’t and ever since I purchased our Instant Pot making mashed potatoes is so easy. I know I can make mashed potatoes on the stove top, but I love the hands-off approach the Instant Pot gives you! I know when the timer has gone off the potatoes will be perfectly tender. We hardly ever make whipped mashed potatoes, which means you whip your potatoes with a handheld or a stand mixer until they are creamy, but I love the textured of using a potato masher instead. If whipped potatoes are your thing, then that’s perfectly okay, as well. 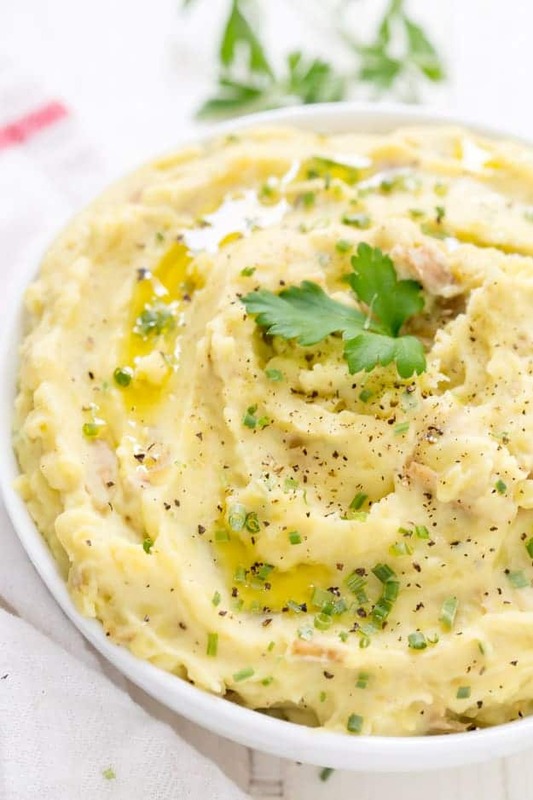 How do you make mashed potatoes in the instant pot? Making mashed potatoes in the instant pot is so easy. You will only want to make them that way from now on, trust me! I decided on using baby Yukon gold potatoes that’s what my store had on sale and they are cute (seriously!). I then quartered them and added water to cover the potatoes. Don’t forget to salt your water as you would on the stove top. You will want to use a sturdy potato that can withstand the pressure and have higher starch. I like to use Yukon gold potatoes because they already have a delicious buttery taste without any butter. Of course, I suggest adding even more butter because butter is liquid gold. Instead of using milk I like to use heavy cream. 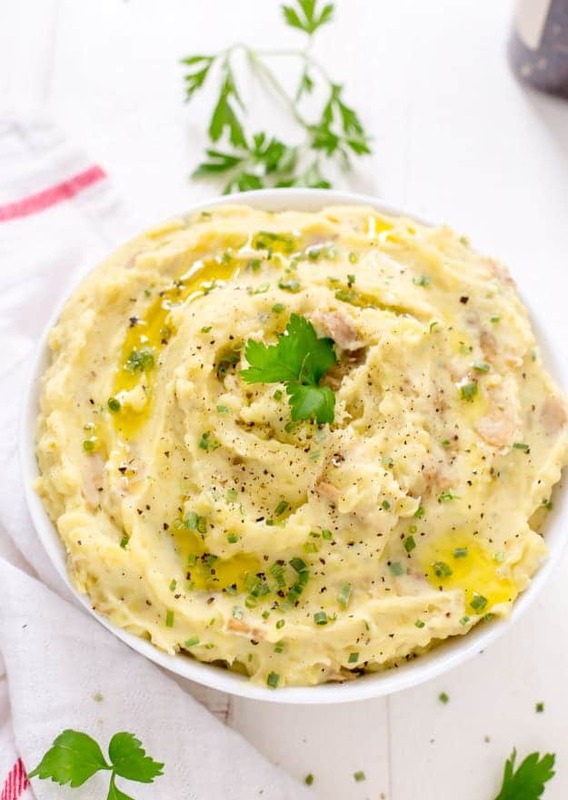 Your mashed potatoes will have more calories but the flavor and the richness of the cream are what makes these Instant Pot mashed potatoes shine and burst at the seam with flavor. can you make loaded mashed potatoes? Every now and then a craving hits and you need a big bowl of comforting loaded mashed potatoes. So good! You can always make all of your mashed potatoes loaded if that’s your thing. I have a recipe for slow cooker loaded mashed potatoes, but you can add a dollop of sour cream and a little sharp cheddar cheese (sounds so good right now!). You can even do a completely different twist and make these amazingly delicious southwestern mashed potatoes. 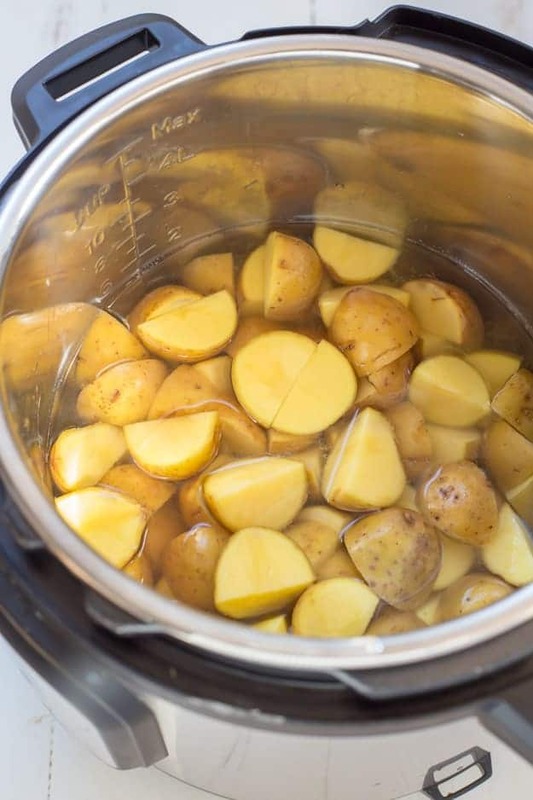 Place the quartered potatoes in the Instant Pot, cover with water and add a pinch or two of salt. Cover with lid. Select "manual" on the Instant Pot and set to 8 minutes and carefully use the quick release method (QRM) to release the pressure. 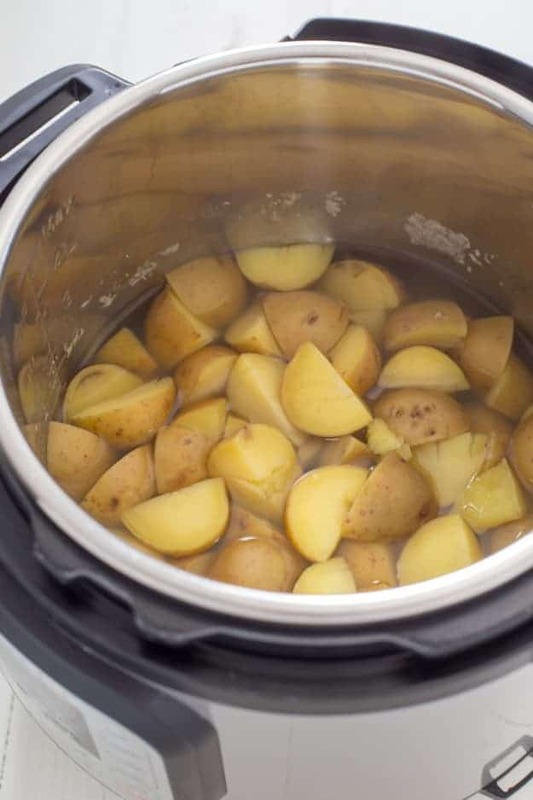 Drain the potatoes and add back into the Instant Pot. Mash potatoes. Add the butter, garlic powder, chives, heavy cream, sour cream and mix until combined. Season with salt and pepper, to taste. Serve and garnish with parsley.